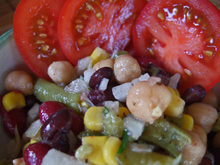 Cleaning the Cupboard Bean Salad - mmm-yoso!!! Is it March already? Man, that was quick.....even with the flaky weather, it's getting to be the time of the year, when we start up our "spring cleaning". It's a good thing that we aren't charged interest on shortfalls during previous spring cleanings! We'd be cleaning for the rest of the year. One of the items is to clean out the canned goods in our cupboard....decided what to do with all these...beans....well, we had to think of something. 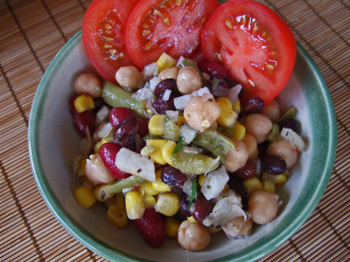 This is what we came out with....it's a bit more "pungent" than the usual 3 Bean Salad, so be warned. I know, it's a lot of canned goods, but we rotate this stuff out of our disaster kit....quick show of hands, how many of you keep Spam®, or some other "necessity" in your disaster kit? Mix together canned items and Jicama in a large bowl. Whisk together olive oil,lemon zest and juice, and vinegar, and combine with salad ingredients. Let sit for 1/2 an hour, taste add crushed red pepper, and adjust other flavors, and mix well. Chill for at least 1 hour and serve. A quick drive through the old "neighborhood." I had to drive on up to City of Industry for an appointment this morning. Arriving early, I decided to just drive around a bit, and noticed a few changes. These places might have been around for a while, but I didn't notice them until today. Yes, it was a Taco Bell! Hmmm, I wonder if the drive-thru is still in use? Drive thru Pho....just make sure you don't drop it into your lap! 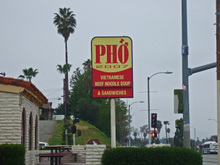 At the least, I know what the "numbers" in the name of this restaurant signify...it's Pho 2007! Can you guess what this one was? This one was a combination KFC - Taco Bell(Taco Smell Bell's aren't doing too well in the area, are they?) in the same area as Hong Kong Plaza. It's now a HK-style Cafe(at least that's what I've been told) called Boston Kitchen. I never thought to add Spam to my disaster kit. I had dark chocolate in there, but ate it as it came up on the due date. I always had a thing for restarants setting up shop in old chain buildings. 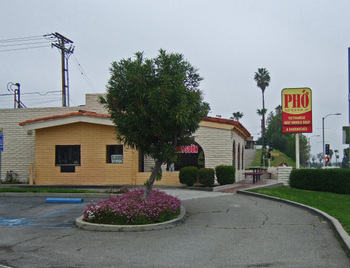 In Milpitas where I grew up, a Thai place set up shop in one of the old Taco Bells. I think it is still there, which means it has probably been in that location longer than the original Taco Bell. Up north they also had a bunch of places called Burger Barn that were in distinctive buildings. I've been to a Chinese Restaurant in an old Burger Barn Building that was....OK (never been to the burger barn though). Oh, and Alberto's has taken up residence in the old Burger King in Mira Mesa. And I think there's a Robert's in an old JITB (J-Bo) over on Pacific Highway. And I'd wager that the Santana's over on Rosecrans was some sort of chicken joint in a former life (Chicken in a basket?). But the funniest are the old Taco Bells. They stick out like a sore thumb. You'd have thought they would have all been torn down by now. But a great many live on. That former Taco Bell joint kinda reminds me of the former Taco Bell joint adjacent to the McDonalds and next to the post office in National City which is now a Checks into Cash store. Strange! Oh, and howdy. I found your site through CharSiuBao's and I've been spying ever since. Thought it's about time I made a comment hehe. The gas stations between Colima and Nogales has also changed it's shape to banks and plazas. That corner looks fancy now. Oh, and you've got to check out the Country Hills Towne Center. They remodeled the whole place. Hi Sawyer - Thanks so much for visiting and commenting. I appreciate it. I'm glad you enjoy Ba Ren, it's one of our favorites. There are so many changes in the area we can't keep up. I saw a sign that Kyochon is coming to Yes Plaza! Hi Jan - LOL! You're right, the unique design of Taco Bells, and I think Pizza Huts, really make them stand out once they're gone and replaced. Hi Brian - Those places just look strange, don't they? Hi Taka - Welcome, and thanks (for finally???) commenting! I remember at one of those gas stations, the Owner locked himself in a cage for some kind of stunt...don't know why I recall that....but I still do. The changes are so rapid that's it's hard to keep track of. And Country Hills Towne Center has changed....I'll have to check that out. Thanks! 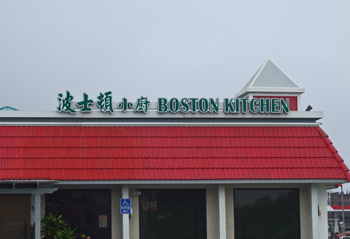 Its called Boston Kitchen cause like all other Chinese restaurants they like to copy names. 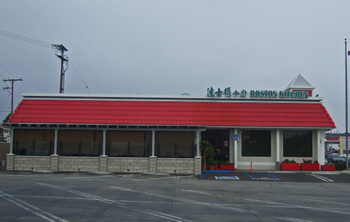 There is a pretty popular restaurant off Asuza/Colima across from Puente HIlls mall and next to Tea Station/99 Ranch called Boston Cafe. WEird thing about that place, they serve all your drinks in plastic cups.. even though you get free refills. Go figure, destroying the environment one boba milk tea at a time. We're so deprived here. We don't have Drive Thru Pho! I'm depressed! I thought it was Robertos that took over the Burger King on Mira Mesa & Black Mountain? I guess Albertos, Robertos, what does it matter?! They did take out the play structure. Across the street is a Wells Fargo bank. Before that, it was a dental office, and way before that, it was - Wells Fargo! Sushi USA on Penasquitos & I-15 used to be a Taco Bell, and I believe you can still use the drive-through window. We actually used the drive-through once to pick up a phone-ahead order. National City has experienced major fast food conversions similar to what's going on in The City of Indy, though Mexican style rather than Asian. Like Brian said, A Taco Smell has become one of about 50 Cheques Casheed along Highland Blvd. An old Long John Silver is now Karina's Mexican Seafood (From what I've heard, you need to check this place out pronto Kirk!). Is it me...or does it seem like the heyday of the National Food Chain is rapidly coming to a close and going 'loco-al'? JUST DON'T KILL OFF MY POPEYE'S, that's all I ask! My school is hosting a can food drive. If you don't need those canned goods or you know someone who are doing early spring cleaning out of their cupboards, please save those cans for me! We're hosting it for 3 weeks. Thanks, Tammy. Hi Sandy - So Wells Fargo got homesick and decided to move back, eh? LOL! Hi Tammy - So where do I send my canned goods? yeah, where DO they get all the Boston stuff from?? the "Boston" sauce they serve at Boston Cafe seems like it's half ketchup, half Worcestershire sauce. is that even remotely a popular condiment in Boston? and of places that used to bee other places.. anyone notice that the Convoy Tofu House is western themed orange adobe inside with embossed cacti on the walls and salon doors that open out into the sushi bar side? did that use to be a mexican food place? Just address it to "Ms. Chau" and the secretary will send them to me. Thank you so much! This is in city heights and it's really close to all the vietnamese sandwiches, mi and pho places. I'm sure you are very familiar with the area=). Hi CSB - Actually, in a former life Katzra took up the entire space. "Kuni" who used to own and run Katzra had a restaurant in the area, along with the sushi bar. Eventually, he sold off the place. I dunno, what the inspiration for the design was. Hi Tammy - Ok, thanks for the info!